Liew Seng Tat, director of the multiple award-winning 2007 film Flower in the Pocket, is back with a much anticipated second feature film that has received worldwide funding support, and before even releasing an official trailer, it’s already been selected to participate in a competition at one of the oldest international film festivals of the world. 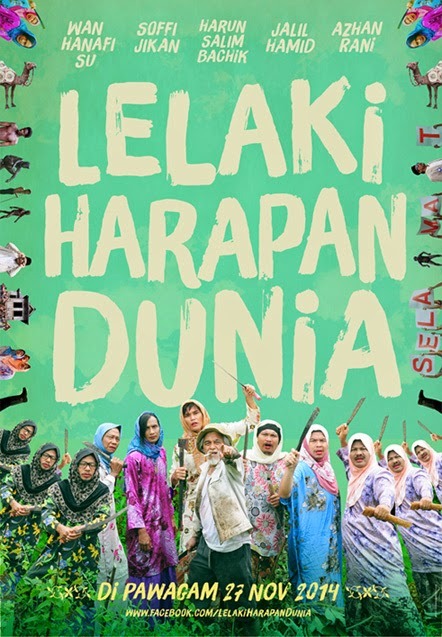 Liew’s Lelaki Harapan Dunia will be competing in the Concorso Cineasti del Presente (Filmmakers of the Present) section of the 67th Festival del Film Locarno vying for the Nescens Prize. Only 15 feature films from emerging directors around the world are selected every year. I know the poster kind of look like one of those typical local Malay movies most of us usually won’t bat an eye at but judging from its synopsis and its rather funny title, it could turn out more than its cover. A satirical comedy like Zombi Kampung Pisang perhaps. It will be facing a very, very tough competition from the other 14 selected film, let us all wish this local production all the best at the event. Synopsis: In a quaint Malay village, the villagers unite to help Pak Awang to physically carry an abandoned house from the jungle into the village as a gift for his daughter who is getting married. Coincidentally an illegal African immigrant who is on the run found the house by accident and decided to hide in it. When the village drug addict, mistook the black shadow he saw in the house as a ghost, the villagers fear that the relocation of the house has enraged the devil. The relocation of the house comes to a halt much to the distress of Pak Awang. A series of wild mishaps befall the village lead to false accusations, hillarious situations and ‘ingenious’ actions to protect the village from ‘danger’.